There are 13 reviews of Tabacco Toscano. This one almost seems easier to describe as what it isn't, rather than what it is. 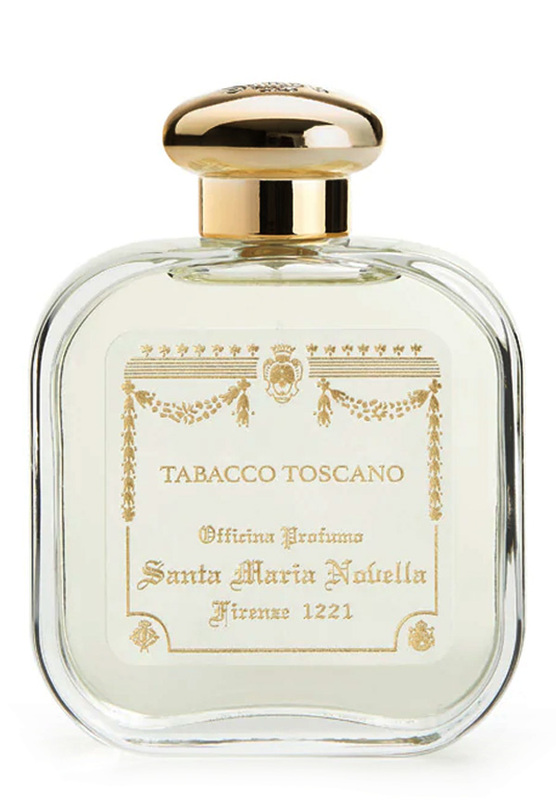 Santa Maria Novella Tabacco Tuscano is not Tom Ford's Tobacco Vanille, a powerhouse that sports a strong, boozy, cherry cough medicine opening. It shares many similarities to Aramis Tuscany, but with more tobacco, less green notes, and longer staying power. To me, SMN Tabacco Tuscano also smells very similar to Aramis Havana's delicious drydown without putting you and your neighbors through Havana's chaotic opening. Rest assured, this is not cigarette or cigar fumes -- instead, it's more like what I would imagine sweet pipe tobacco to be like, but not cloying or heavy. It does seem to have a foodie vibe, like waffles and maple syrup, so make of that as you will. Overall, a highly wearable, noticeable skin scent with low sillage, appropriate for most occasions, times of day, and seasons. A very nice take on the tobacco note. Opens with a bright sweet unsmoked tobacco and something I first thought was cedar, but perhaps is birch. This is not sharp, but a soft fluffy scent. It never gets too sweet and as another reviewer noted, there is a 'new rubber' note hidden deep inside and never quite jumping out. Very nicely done. Tabacco Toscano comes off as a soft interpretation of tobacco rather than a full scale exploration as one had hoped it would be. Tobacco is laced with an accord of amber-vanilla. To me - this is a not so interesting tobacco twist on a straightforward amber fragrance. Leather would have perhaps given it a nice spin, but I hardly get any. The amber accord does add a nice rich brightness to the tobacco, but still it is not interesting or compelling. Good quality materials are employed, but it could have been more distinctive - like Acqua di Cuba as an example. Et nous vous suivrons, brunes cigarières, en vous murmurant des propos d'amour! Tabacco Toscano is the memory of an unsmoked cigar—earthy and green played against a rich, sweet background of amber and malt. No smoke here; this is all about the vegetal tobacco leaf with a hint—thanks to the bergamot and jasmine top notes—of the tobacco flower. Nor is there the smell of the wooden cigar box or leather tobacco pouch. This is all about the tobacco, and a fine representation it is. Distinguished and manly… and yet, this could be the smell that clung to Carmen’s thigh as she leaves the manufacture des tabacs that fateful evening, sealing her fate—and that of Don Jose—forever. A French opera set in Spain, you say? Where does Tuscany come into this? Wear it and remember the Duomo of Florence, the Palio in Sienna and la dolce vita, Toscana style. There are no member images of Tabacco Toscano yet. Why not be the first? Santa Maria Novella Tabacco Toscano - Bulgari Black Lite?